Each of us is given some measure of talent, though we often don’t recognize it and rarely do we act upon it to its fullest potential. More often than not, we wish for the talents we don’t have instead of appreciating those that we were fortunate enough to be given but I think that those that do, that small handful of people who manage to connect with their creative abilities, find a measure of fulfillment that few of us will ever know. I have been fortunate in my life to know a few people that are truly gifted with talent and who also recognize that fact as they explore and exploit their inner potential, finding joy in what they do and spreading that same joy to others who marvel at their abilities. One of those individuals is a talented artist named Scott who comes from the same small town that I do and whose works I have been exposed to most of my life. Over that time, I have probably seen at least a hundred or more of his paintings, each one unique, yet all are imbued with common elements that give them a familiarity and a connection to the artist who created them. The first one I ever saw was of an old, aged railroad caboose, sitting forlornly on the side rail of a track long abandoned in a wooded area mostly forgotten. It told a story of a life now past, of adventures and travel down the rails in an era when trains were the dominant means of getting from one part of the country to the other. The miles it must have travelled and the vistas that it must have seen in every direction were reflected in the fading, peeling red paint of its wooden boards and even in its state of decrepitude, it was beautiful, if a bit haunting to see. This painting, a gift from my father to my mother, hung for thirty years in our living room and for the past seven has hung in the hallway of her current home. Others would join it, each one bringing something new to look at and admire but the old caboose, entitled “The end of the line” would always be first and the beginning. Scott has a way of capturing the essence of his subject and presenting it in a way that leaves you wondering what the back story is behind it. In his younger years, he enjoyed painting things that time had passed by and which had seen better days like the railroad caboose. Old ramshackle barns were a favorite subject and back then, they were as plentiful as pine trees in Georgia so there was no shortage of them to paint. Some paintings were quite large and probably took several days to complete while others were very small and might have been painted in a matter of hours if he was so inclined. Painting was as natural to him as breathing is to us all and he could capture a moment with a brush in a way no camera could every duplicate. A painter by choice, he was equally talented with drawing in ink or sketching with a pencil but it was in the limitless spectrum of the watercolor paints that he found the best ways to capture the moment, commanding them to draw out the depth, to highlight the perspective, emphasize the shadows and convey just the right atmosphere. Barns might lead to houses, some preserved, some forgotten, and then to boats, some seaworthy while others were permanently beached. Over the years, our house became filled with Scott’s works, a permanent gallery that included the caboose, several old barns, a Victorian porch, the ruined Corinthian columns of Windsor and a villa, probably from a trip overseas. In my mind’s eye, I can picture each one of them and see exactly where they hung in our family’s home the entire time I lived there and for years afterwards and I grew familiar with each one from being exposed to them for so long. In most all of them, with a few exceptions, they capture the landscape and the essence of the South that I love, of old things, some preserved and some left to the whims of nature and the elements, expressed in a way that other mediums fail to do. The ability of the watercolor artist with their unique ability to encapsulate, clarify and romanticize their subject in full color is a talent few possess in great measure, yet it is second nature to Scott as evidenced by the vast portfolio of works that he has produced in his career. My family was not alone in the membership of the “Coleman Club”, my own name for the circle of collectors that appreciated his works and frequented his art shows. While his painted works went to homes all over as his reputation grew, in no place was the concentration likely to be as large as in his own hometown where his paintings could be found in both homes and businesses. A knowing fan could identify one on sight, regardless of whether they had ever seen the painting before or not. As soon as you saw it, you recognized the work of the artist who had drawn the image from his mind and translated his vision into something others could enjoy. While the caboose held a prominent place in my parents’ home, another one held an even more prestigious position, the centerpiece of the room over our fireplace and that was the painting my parents commissioned of our family barbecue restaurant, shown just the way it looked at the time and in the thirty five years since, it has changed very little. I suppose it was a natural fit for Scott because the building was and still is old, aged and worn by time; its paint somewhat faded, its metal roof a bit rusty, exhibiting all the charm of a country roadside barbecue stand and the epitome of all that is the South. My love of architecture has always drawn me to paintings that depict some of the finest details of buildings and Scott’s paintings always feature an abundance of architectural detail. The one over my own fireplace was a gift from my mother to us when we bought our first home and the portrait shows in great detail a section of a Queen Anne style mansion that is one of our town’s historic landmarks. 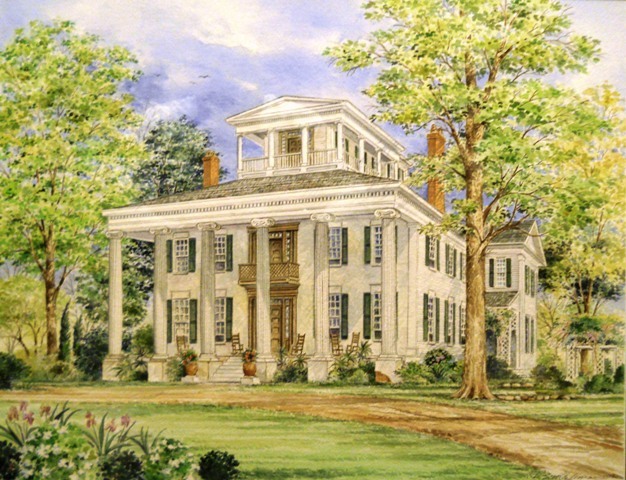 While I love the house itself, the painting is full of the details that makes the house unique, including an elaborate cornice, dentils, columns and decorative porch ceiling, framed against a backdrop of old tree branches and a clear blue sky. It appeals deeply to the inner architect that lives inside of me but it also is a slice of hometown that will always be a part of my history. Over the years, he has painted many of the objects I associate with my life; the lavish mansion I passed by often on bike rides through town; the restaurant I grew up around; the courthouse I see every day and the church I have always worshiped in, buildings of stone, brick and wood, preserved in watercolors and presented in a vision of how he sees them. Some are painted in the full light of day while others are rendered in the golden light of the late afternoon or the red of a sunset. For nearly two years, I have studied the history of antebellum architecture, favoring the beautiful old Greek Revival homes that are today a fading remnant of a past long ago and in my studies, one old home rose to the top of my list of favorites, a mansion now abandoned and left to die a slow death from the elements and the lack of resources to prevent it. I wanted to capture the beauty of this home and preserve it so that I could enjoy it and I knew there was only one person who could do that and so it was to Scott that I naturally turned to. I only had to give him a few photographs, some old and some new, with only a minimum of instruction as to the condition I wanted it to appear and from there, he turned it into a reality on paper and completed it today. Painted by the light of the springtime sun streaming in through the large glass windows of the studio he shares with his equally talented wife, the old home had new life breathed into it by someone who had never seen it in person but who knew it intimately from decades of painting its kinsmen. In my eyes, it is a masterpiece that expresses the beauty of the place and no one could have done it better or with more skill than an artist who knows his talent and can wield it vigorously. They say that artists live in their own world and to a large degree I believe this to be true. Each artist sees the world in different ways, just like each person sees the world differently, but the artist has the ability and the talent to bring the world that they see into the world that we see, affording us the opportunity to visit it by opening a window for us to peer through. The world that artists such as Scott and Kathrine visit daily for inspiration is closed for many of us but through their works, we are allowed to visit, to sit for a spell on the porch of creation and drink it all in, one artistic work at a time. Artists come in all shapes and sizes, each one specializing in different genres and possessing different techniques and while this is what sets them apart from each other, it is also the common thread that they all share. They bring beauty, creativity and inspiration in no small measure to the rest of us who marvel at their talent and envy them the creative forces that they have somehow harnessed and put to work. Long before words were formed into language, artists wrote history through their images and left these behind for us to appreciate and to learn from. I may not have their talent but I am personally glad that I have been given the ability to recognize and appreciate those who do and to see an occasional glimpse into the world they create. Thanks for putting words to what many of Scott’s fans feel. We’ve known and admired Scott and his talents since 1967 and have a small, treasured collection of his and Kathrine’s works. Thank you…artists seldom get the recognition that they deserve for the beauty they bring into the world or the memories they capture and preserve for future generations to enjoy. I now have custody of 53 and they all hold a special place in my heart and in my home but the cabosse and the portrait he did of Daddy will always be my favorites. Thanks for the memories.